This special plan for new clients offers unlimited access to all studio classes for 2 weeks. Come enjoy the boutique environment of our studios with small classes led by skilled, supportive instructors, designed to give clients individualized attention with a particular focus on technique and form. An exceptional value for new clients only that lasts 2 weeks from the date of the first class attended. This is a very special trial offer that is not eligible for early cancellations or refunds. 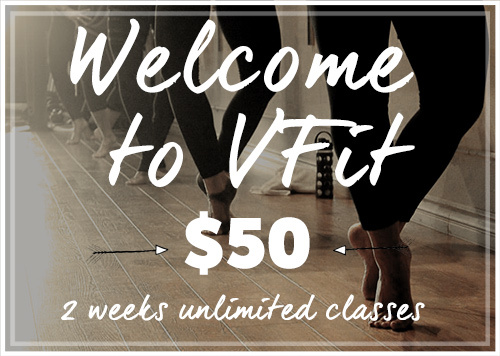 Created to make it easy and limitless for our highly motivated and active clients, this package offers full, unlimited monthly access to our 42+ classes, early signups to reserve your spot in our most popular classes and 10% off special workshops and events at the studio, as well as special offers on retail items. Our very best value package with a monthly $159 auto debit and a 3-month commitment which at the end of the initial 3-months will conveniently autorenew to a monthly term. For committed clients who typically fit in 2-3 classes a week, this package is a fantastic deal. Get 12 classes a month -- any class, any time -- at a the low price of $139/month with a three-month term. A value package with a monthly $139 auto debit and a 3-month commitment which at the end of the initial 3-months will conveniently autorenew to a monthly term. For busy clients who typically fit in 1-2 classes a week, this package is the best option. Get 8 classes a month -- any class, any time -- at a the low price of $99/month with a three-month term. This contract is a monthly $99 auto debit requiring a 3-month commitment which at the end of the initial 3-months will conveniently autorenew to a monthly term. *With the exception of Flex and Flow Plus, auto debit contracts are a 3 month commitment. After 3 months a 30 day cancellation notice is required to terminate a contract. We allow one free 1-month suspension of your contract every 6 months, subsequent suspension months are charged $25 per month..
*All clients who are currently on L&G, Flex & Flow, Flex & Flow Plus will be grandfathered in to their current contract. The grandfathered price will be terminated upon termination of contract. ​Hit it as hard as you want without a long term commitment. This pack provides unlimited access for one month. A single upfront payment of $179 for unlimited access for one month. Class passes expire after one month. A single upfront payment of $159 for 12 class passes. Class passes expire after one month. Want the convenience of booking more classes in advance or using more than 12 in a month? 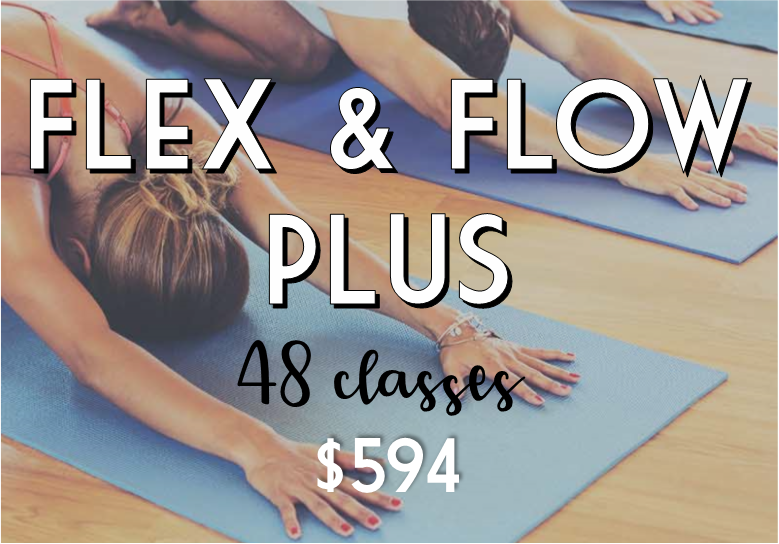 Flex & Flow Plus gives you the same great value with full access to all 48 of your your classes right away. Flex & Flow Plus is paid in full upfront with a single auto debit of $594. Classes may be booked/used any time within 6 months from date of purchase. This is a very special offer and is NOT eligible for refunds, early terminations or suspensions. *Anytime class passes are paid with a single upfront payment and expire after one year. We pride ourselves on direct and transparent pricing -- no sign up charges or hidden fees! In most cases, plan changes may be accommodated (unless specifically noted in the agreement terms). Please note there is a $25 administration fee to process term changes and suspensions during active contract periods. All plans and passes cover any class, any time with the exception of private training, workshops and special events -- these have separate fees. Discounts on these additional fees are available with certain offers such as the Love & Gratitude package. ​Many of our group classes require the use of equipment and therefore have limited available spaces for students. These classes include Barre, TRX® classes, PowerHour and Power Up, Spin and Spin Fusion Classes, Rowing, as well as Aireal® Classes. In order to reserve your space, be sure to sign up early using our online scheduler. All classes require 12 hours advance notice for cancellations. Cancellations made with less than 12 hrs notice will be charged the full amount of the class. Clients on an unlimited monthly package will be charged a $10 late cancellation fee. Ventura Fitness Studio classes are open to clients age 16 and older. Participants under 18 years of age must have a release waiver signed by their legal guardian. Special circumstances will be considered, please contact the studio for more information.